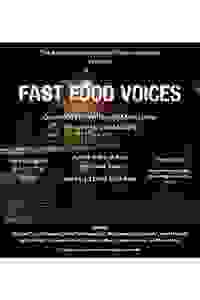 Some are comic, some heart-breaking, some profound and some profane -- but nothing will stop the men and women of "Fast Food Voices" from having their voices heard. This is immersive theater without a formal curtain, but expect performances to begin approximately 8pm evenings and 3pm on Saturday. Feel free to go early and/or stay late to have a drink and mingle. Don't see it if you don't enjoy non traditional theatre.